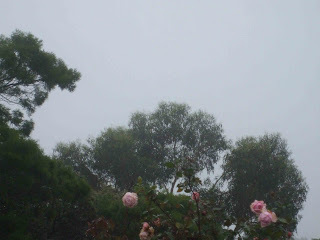 Seriously it is raining here again today for the 4th day in a row..... Goodness, our pond in our bottom paddock has water in it for only the second time since we have lived here. I am sure that the farmers are very very pleased but I think that we need a little break from it now. I am not sure if it is the rain making me feel blue this week or the horrible mess everything around me is in at the moment? The shop still needs two coats of paint and then the floor coverings laid. 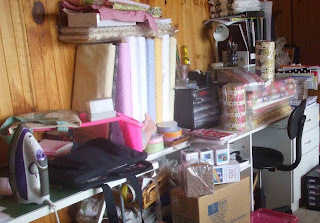 Until then all of the stock that I have been busy gathering is making my studio look like a store room. See what I mean ?????? 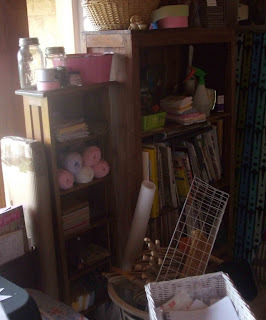 It is a long weekend here so I am thinking that today should be spent trying to get a little order into this room but to be quite honest I am not really sure where to start and even where I am going to put things for the interim? Don't you just hate being in limbo like that? Oh well, it will work out soon enough. I can't wait for your store to open!! The best medicine on a rainy day is to keep busy. I think a little sunshine would be good too though. I am over the rain now and the kids are too. Have fun organising. It seems so many of us a feeling like a bit more orderliness around - maybe quilting is messy and we just have to wear it! When you finish your chaos can you come and do mine???? The rain is good. Hope to get heaps more. Good long weekend to get busy sewing. It finally stopped raining here and is beautiful today! I hope your rain stops soon! And everyone needs a little creative chaos!